San Francisco, CA., May 16, 2017 – eZ-Xpo, the global leader in All-in-1 Virtual Collaborative Network Solution, today announced JobExpo365 is powering the first national virtual workforce and job fair dedicated to women in Ghana. 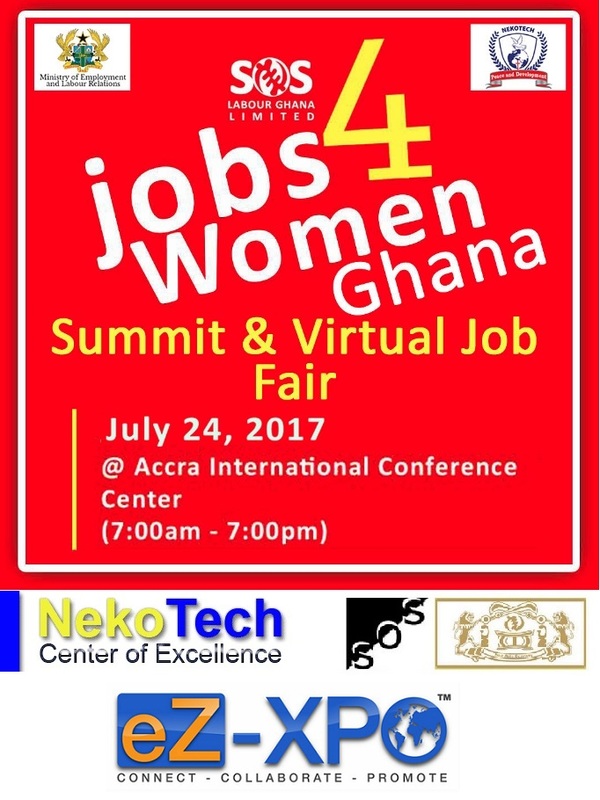 The Virtual Job Fair will start immediately in conjunction with the physical event on July 24th, 2017 SOSJobs4Women Summit and Job Fair in Ghana. SOSJobs4women National Virtual Jobfair is an initiative of the Nekotech Center Royal Academy for Peace and Development in partnership with eZ-Xpo USA and the Ghana Ministry of Employment and Labour Relations and in collaboration with the Diasporan Relations Office of the Office of the President of Ghana, the AU Diasporan African Forum, Ladies of the Cross, Transform Ghana Project, Skill2Scale of the University of Canada, Transfer2Transform Canada, and the SOS Level Changers of the University of Ghana – all joining hands for jobs for all Ghanaian women everywhere. “We are pleased to partner with the multiple awards winning Nekotech Center Royal Academy for Peace and Development’s initiative – sosjobs4women Ghana – and other stakeholders, to prioritize job placement for all Ghanaian women everywhere by employing this innovative virtual job fair, ” said the Summit Host, Hon. Ignatius Baffour-Awuah, MP, and the Minister of Employment and Labour Relations. 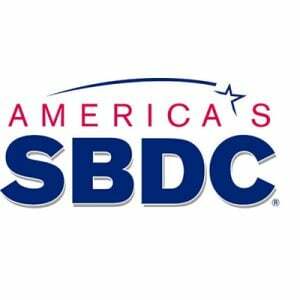 ” Ghanaian diasporans contribute over $3billion annually to the economy. This virtual job fair will enable Ghanaian diasporan women overseas an invaluable opportunity to find decent jobs in Ghana while considering to come back to Ghana without taking expensive trips home to search. In addition, providing Ghanaians with decent job opportunities overseas will enable us to increase remittances beyond the current $3billion. 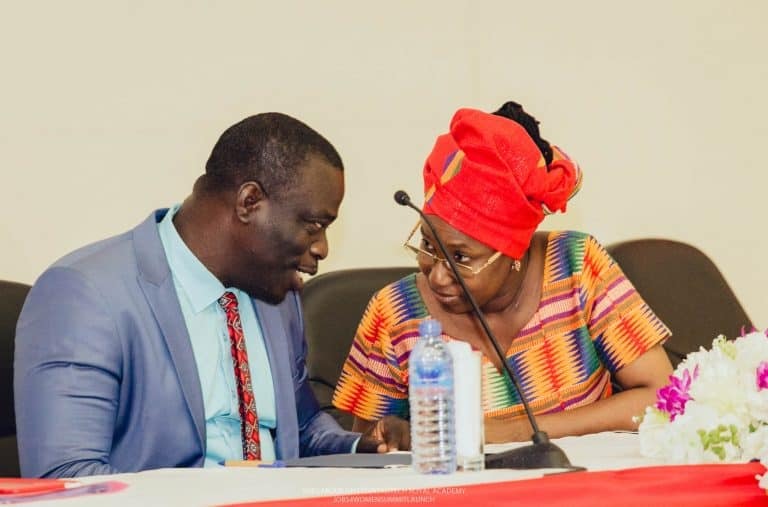 I see this as a breakthrough for diasporans and Ghana.” said Mr. Akwasi Awuah Ababio, Director for the Diasporan Relations Office, at the Office of the President of Ghana. ” The AU Diasporan African Forum (AU DAF) is uniquely interested in making sure we secure the best candidates for each position by providing soft skills training which will make the women – both national and diasporan- more employable and to encourage them to perform as ideal workers for their future employers, ” said HE Ambassador Dr Erieka Bennett, Head of Mission and training partner for sosjobs4women Ghana. “We are excited to partner with eZ-Xpo and JobExpo365 to deliver this game-changing solution to solve Ghana’s unemployment and recruiting challenges, especially in recruiting qualified women. Now, these women can connect to hiring managers worldwide virtually on-demand and live 24/7 in a virtual workforce network ecosystem. Job seekers can get a fast start to engage and collaborate with all potential employers globally via the Virtual Job Fair,” said Her Excellency Rev. Dr. Ocansey, Founder of SOSJobs4Women. “We are excited to partner with HE Rev Dr Ocansey at SOSJobs4Women to host the first national Virtual Workforce and Job Fair at Ghana where we connect all qualified candidates and recruiting managers virtually 24/7 worldwide. JobExpo365’s Virtual Job Fair Network offers both Job-seeker and employers a virtual booth to showcase their accomplishments and opportunities respectively. It also breaks down all barriers and opens unlimited opportunities to all qualified talents and companies with virtual training and virtual showcase in a virtual booth,” said Matt Fok, CEO of eZ-XPO. eZ-Xpo is a world leader in Virtual Collaborative Network empowering businesses to connect, collaborate, and promote through networks of virtual expo marketplaces for lead generation. eZ-Xpo reinvents the trade show and lead generation industry with a revolutionary new approach to virtual events, virtual trade shows, private business networking marketplace. eZ-Xpo delivers the world’s 1st all-in-1 virtual expo marketplace that seamlessly integrates with built-in marketing automation to follow up with every prospective customer during and after the event.